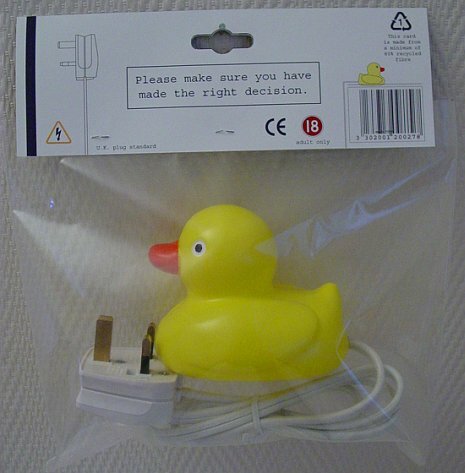 The Electric Bath Duck – Cool Gift Or Suicide Helper? | OhGizmo! 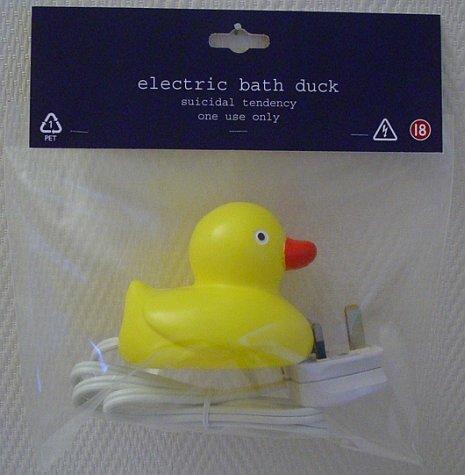 This somewhat morbid bath duck is tethered to an electric cord, with a packaging that says “Electric Bath Duck, Suicidal Tendency, One Use Only” and “Please Make Sure You’ve Made The Right Decision” on the other side. Cute. Although it seems to be aimed at people ready to commit suicide, it could presumably also be given as a gift to people you don’t really like; a hint of sorts. Whatever the case, don’t be sending us hate mail thinking we’re condoning either activity (although we do (well, “I” do) know a few people that do deserve this ducky)), we just think it’s a clever little toy. Of course, it doesn’t seem to be a commercial product. The links lead to what appears to be a product page, but no purchasing information. Perhaps a gag? An artist project? We’re not sure, but there you have it anyway. One more picture after the jump, plus the link love. this is not cool gift. I think this might have been inspired by the recent news that Cho Seung Hui (VT shooter) had a thing for rubber duckies. Perhaps the artist is making a statement that if only Cho ordered *this* one a week before the shootings… You get the idea. Nice gift.Its really so cute.Keep it up. Its really a cute gift.I like this.Keep in touch with us.